OK, Swine Flu out of my system, ready to report on the latest goings on...yesterday was my first full day home alone in almost three years, and I put myself to work on some larger-scale garden/homestead projects: constructing our first, true compost pile, and revamping our graywater system. Having a small child has altered my ability to put in garden time as I would like. 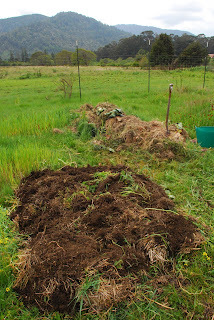 Tasks that need to be completed always keep a to-do list full, and compost is no exception. For the nearly three years we've lived here, I have just piled weeds and such for compost without much attention. 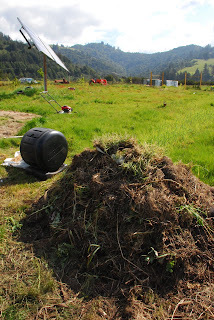 This technique does produce useable compost, though at a much slower rate than with concentrated effort. 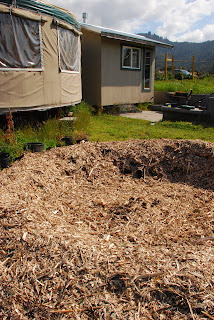 We finally had enough material to build a large pile, and we also needed a spot for the graywater sludge I was about to pull out of the stinky graywater pit, as well as the slowly increasing supply of chicken droppings. So my first order of business was to consolidate the two windrow style piles I've made with last year's corn and tomato stalks, brassica remains, and this years grass and weeds I've pulled from beds I'm preparing for planting. First you layer some sticks or woody stuff, to try to create some aeration at the bottom of the pile. Then you layer dirt, green stuff, and dry stuff alternately until your pile is the size you want! Oh, and it is also important to water your pile as you build it, aiming for the moisture of a wrung-out sponge. I'm not sure how you test this, but keeping it moist helps the pile get active and rot faster. 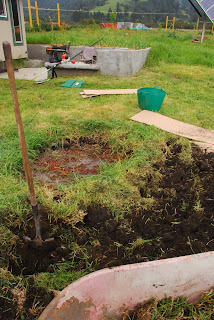 The pit all dug out with the mound in the center for a tree. The bathhouse, source for a lot of graywater, is the boxy building in the background. After lunch, I took on our graywater pond. It's been in operation for about a year now, and within a few months, it's ability to digest all the particles of food from our kitchen sink was overwhelmed. It seems that the volume of water compared to the size of the "mulch pit" was too great as well. This represents a design error on our part. But after viewing a great graywater video interview with my friend Trathen Heckman of the non-profit Daily Acts about his awesome graywater system in Petaluma, CA, I got some ideas churning. This was helped out by Drew hiring our neighbor to make a giant pile of woodchips this past weekend. I decided I would greatly enlarge the mulch pit area, and fill it with woodchips, constructing a much-improved, true mulch pit. 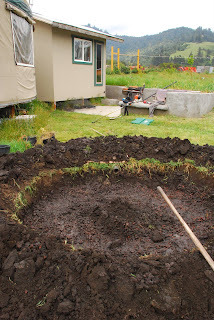 This involved a lot of dirt and mud wrangling, hacking up a fresh part of the lawn, and rearranging the gooey water and gravel such that I could work with the space. After several hours of shoveling and hauling, I admired my work, exhausted! The idea of the mulch pit is to plant something in the center, like a fruit tree. I am going to wait and see how it performs, but just may add a plum or apricot, or some such thing, if the pit demonstrates its ability to process our bath, kitchen, shower, and washing machine water. I'm optimistic about a non-stinky location to recycle all that great water for garden use. We also may cover the outlet, and fill up the pit further, so it's less of a pit, and more of a depression. Then we could use the space instead of avoiding it all together.